Give the Gift of Teeth Whitening in East Islip! Your smile plays an integral role in the impression you make when you meet people. The confidence that a bright, beautiful smile brings is priceless! This year give your family the gift that keeps on giving with teeth whitening in East Islip. You can choose from two convenient options based on your family member’s lifestyle. Do they have a busy and hectic schedule? Would they prefer to whiten at home at their leisure? Your dentist offers options to meet every need. 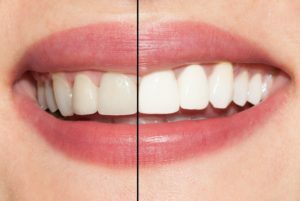 An in-office whitening treatment is perfect for those who don’t have much time to spare and would appreciate immediate results. During one short visit to your dentist in East Islip, your loved one will receive a whitening treatment that can brighten their teeth six to ten shades. It is a safe, effective, and non-invasive procedure that can deliver a huge impact to their smile. For those family or friends who would prefer to whiten their teeth at home based on their own schedule, a take-home whitening system is the ideal option. Your dentist will create custom whitening trays using impressions taken of their teeth. Custom trays offer both optimum results and protection against excess whitening gel since they provide a secure fit. This option delivers results in one to two weeks and your loved one can keep their trays and purchase additional whitening gel to brighten their teeth in the future. When you’re giving the gift of a brighter smile, you want to ensure the best results for your loved one. Over-the-counter products are one-size-fits-all and don’t have gel as strong as what your dentist has access to, so they may not deliver exceptional results. Giving your friends or family the gift of whitening with your dentist will ensure they receive comfortable, safe treatment that allows them to achieve the smile they’ve always wanted. Contact your dentist in East Islip today to learn how you can change your loved one’s life this year with the gift of teeth whitening! Dr. Gary Rosenfeld has been serving the community of East Islip, NY for over 30 years. He has gathered a team of exceptional dentists who share his vision for providing high quality and comfortable dental care in a warm and friendly environment. East Islip Dental Care truly caters to their patients’ needs because we’re open seven days a week and provide both morning and evening appointments. Where else can you find those kinds of options? If you would like to contact East Islip Dental Care, our team can be reached by calling 631-581-8600 or through our website. Comments Off on Give the Gift of Teeth Whitening in East Islip!